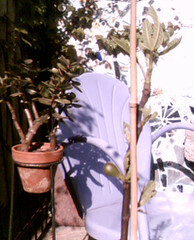 Look closely at this stalk that we put in the ground a week or so ago, soon to be a fig tree. Not only has it sprouted its first foliage (upper right area of photo) but its first baby fig (green thumb shaped protuberance near bottom of frame). These are the delights of the urban gardener. We planted this crabapple in front of our house two years ago, and this is the second spring it has bloomed. 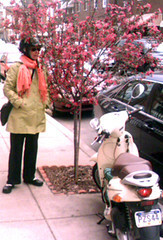 The clusters of deep pink blossoms seem especially vibrant when contrasted with the lime green jacket and peach pashmina of the stylish Miss D. As balmy weather returns to the City of Brotherly Love, we’ve been loving our scooter rides, too! 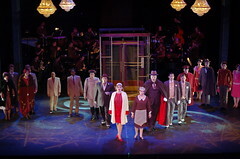 Senior musical theater student Jarrod Lentz snapped some terrific photos of Grand Hotel during the dress rehearsals. Click on the image about to go to my flickr page and look at the rest! You are currently browsing the CHAZZY(BLO)G blog archives for April, 2006.